Waistel Cooper lamp base - 6½" (165 mm) diameter, 5½" (139 mm) high. Waistel Cooper, a Scot born in 1921, set up his pottery at Porlock in Somerset in 1952. He was a potter of some distinction, and his speciality was textured surfaces; he was known, though, to use wood ash glazes from time to time. 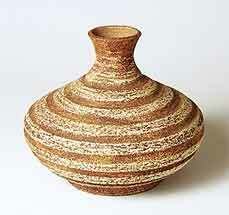 In 1983 he moved to Penzance, Cornwall, where he operated from Barbican Pottery. His mark was the brushed forename 'Waistel' in black.